As I’m sure a lot of you know, Surefire recently released their XC1 weapon light. What you might NOT be aware of it that there is also at least one Chinese knock off or “clone” as I will refer to them going forward. With the real thing having an MSRP of $300 and a retail price around $270, you might find a “deal” that ends up being a clone, so I’m here to show you how be sure you’re not getting taken. I have seen clones for sale on Amazon being sold as genuine Surefire at over $200, when they should cost $50-60. First of all, if you stick to buying directly from an authorized Surefire dealer, you’re pretty safe. However, with the ever growing popularity of online retailers like Amazon, it’s harder and harder to stick to said authorized dealers. OK, now to the brass tacks. I’ll first go over some cosmetic features that differ, so you can hopefully avoid buying the clone to being with. The Surefire XC1 has a black, slightly glossy, hard anodized finish with laser engraved markings that appear silver/white. The “XC1” marking is just the outline of those characters. The clone version also has black anodizing with laser engraved markings, but not as deep or “clean” as the real thing and they appear grey. Most notably, the clone’s “XC1” marking is solid. Surefire’s momentary switch looks, at first glance, like a “rocker” like you’d commonly find on a weapon light. However, there are, in fact two separate micro switches (one on each side) with a button pinned to the switch posts. The clone’s switches (also appear to be a rocker, but aren’t) are longer, a different shape, and have no pins. They also operate differently but more on that later. Surefire’s constant on switch is located further up on the light (slightly rear of center of the body) and has fairly large oval shapes recesses on either side of the body to better facilitate switch operation. The switch is a cross block switch, similar to a cross block safety found on many shotguns and rifles. 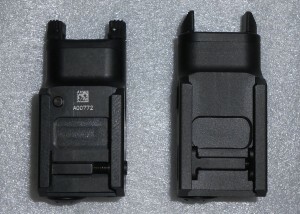 The clone’s constant on switch is also a cross block type and is in roughly the same place as Surefire’s, but with a significantly smaller relief around the switch. It, once again, operates differently and, again, more of that later. The Surefire has a serial number and QR code on the top of the body to the rear of the locking bar. The clone has no serial number or QR code at all. If you’ve somehow missed all of these signs and ended up with a light that you’re not sure about here are some things to look for once you have it in your hot little hands. The “business end” has some more good signs, but they may be difficult to tell from photos. The clone’s reflector is smooth and the lens in quite visible. The Surefire is slightly smaller and lighter than the clone. The clone’s slightly larger dimisions (particularly the extra length) causes some compatibility issues. Unfortunately, I do not have a scale that will accurately weigh these so I cannot include that data. The Surefire was designed with the Glock 19 in mind but also the capability to fit other pistols with a picatinny type rail, and it does that. I’ve mounted mine to several full and mid-size guns and none have been an issue. intended to use standard lights. The clone on the other hand has some big compatibility issues, and this is where the extra length that I mentioned before becomes an issue. While it does fit a Glock 19, it WILL NOT fit an M&P. Another problem with the clone that the Surefire does suffer, is the locking bar. On the clone, you must entirely remove the locking bar to install it on a rail (pistol or otherwise). The Surefire does NOT require locking bar removal, only loosen the locking bar’s screw. Let there be light. I should note that both units were tested with brand new Energizer “AAA” batteries from the same package/lot. The Surefire is rated at 200 lumens according to Surefire, and I have no reason to doubt that claim. The clone is also listed at 200 lumens according to the Hong Kong retailer this unit came from. However, I certainly question that. While I do not have a proper light meter to measure the output, I can say that testing side-by-side, the clone is simply NOT as bright as the Surefire. Even if I’m wrong, and the clone is close to 200 lumens, the Surefire DEFINITELY has a better “flood” and covers a wider area. The photos don’t really accurately capture the differences visible in person. switch to activate the light, releasing will deactivate. see why I now I do. The clone’s momentary switch has to be pushed in (forward) to activate, release to deactivate. off (very briefly) and then back on. Not a good thing if you want/need the light off, especially under stress. On a side note, I find the constant on switch to be in a bad place. You have to shift/break your grip on the pistol in order to operate it. This is a minor issue for me as I rarely use a weapon light in constant on mode, but I though it worth mentioning. Two final give always that you can pretty much only find out in person. clone’s anodizing. I’m not advocating that you take a blade to your light, in fact don’t do that. It just happened to be the easiest method I could think of to test the finish. The battery cap on the Surefire has a deep recess with a plastic/rubber “washer” inside. The clone’s battery cap has a shallow recess and no “washer”. So there’s pretty much everything I can tell you about how to spot a clone. Do your due diligence, and buyer beware. That said, I know some of you might be tempted to purposely buy a clone to use on airsoft guns for FOF training or general farting around. So let me add one more thing. 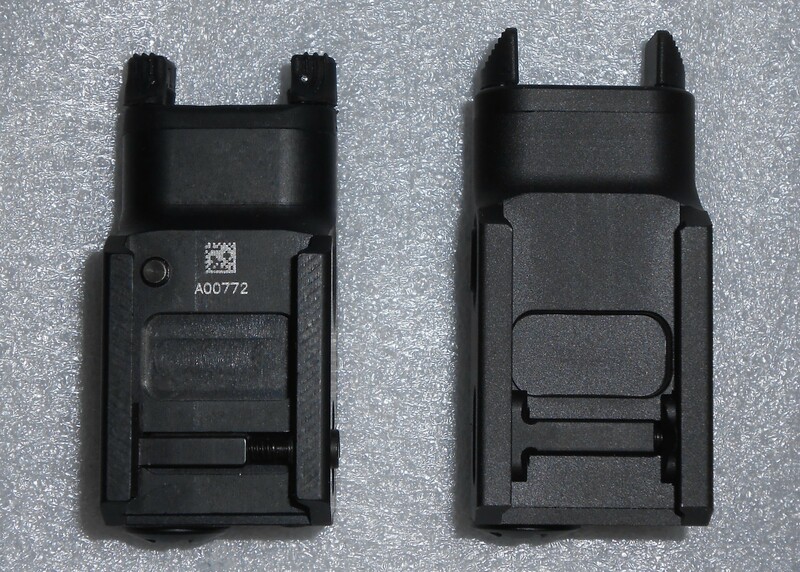 The clones do not fit most airsoft Glock replicas (the frames are too wide), M&Ps etc. They only seem to fit full sized 1911 and M92 variants with railed frames. During Force on Force, you pit your skills against live roleplayers in situations based on actual self-defense incidents and cases. Scenarios will include self-defense situations, close quarter encounters, active shooters, robbery, and other situations. This training event provides a series of scenario-based exercises where you can practice your defensive pistol skills against live opponents in a dynamic Force-on-Force environment. Blue Guns, Airsoft and other training weapons will be used. This law-enforcement training facility features an indoor training space with several different scenario rooms, including a home, convenience store, bar/restaurant, and more. Because of the challenging nature of this course, all participants must have some handgun experience. We recommend QSI Basic Defensive Handgun or similar training. If you are unsure about meeting the prerequisite requirements, please contact us. Required Equipment: – Paintball/Airsoft mask with full face protection. You can pick these up at most sporting goods stores. The following equipment is recommended. If you have your own, we appreciate you bringing it, but we will have enough “loaner” gear for the class. This program includes some physical contact and roleplaying with other participants. We hope you can join us for this unique training opportunity! Angstadt Arms has an interesting new 9mm carbine based on the AR15 platform. Their carbine comes in several different SBR and standard configurations, uses Glock magazines, and is compatible with most aftermarket 9mm AR15 parts. The upper and lower receiver are billet machined and fit and finish looks very good. It’s a promising design and we’re looking forward to seeing more of this gun in the future. This was by far the best thing I saw in the Taurus booth, and I find it to be a clever idea. According to the rep I spoke to, this hammer will soon be standard on all Taurus revolvers, but is currently available on only a few models. The hammer spur is removable, turning it into spur-less hammer, which is generally better suited for concealed carry. To remove the spur you simply grab hold of the spur, turn counter clockwise 1/4 turn and pull. There is a detent pin (and spring) that keep the spur from falling out/off when it is installed. To re-install simply orient the spur as it was originally, and press it in. The detent pin will click when it locks the spur in place. The rep said that spare spurs will be available as they are aware that people may lose them. Because apparently Taurus thinks that women need “wings” not only on their feminine hygiene products, but on their pistols too. As the Taurus rep I talked to told me “this gun is for women”. I should also mention that the “wings” only aid in gripping the slide if you use the “slingshot” technique, which I do NOT advocate. Also the wings have to be manually deployed, which under stress is not going to end well if you’re relying on said wings in order to operate the pistol. In my opinion, f you cannot safely operate/manipulate the slide on a semi-auto handgun, then you should consider buying a different pistol, or buy a revolver instead. In the case of the TCP (with or w/o wings) you would not sacrifice any capacity and you would gain the advantage of having a caliber better suited for personal defense. In the interest of not being completely negative, I will add this. The TCP (w/wings) has an okay trigger, a slide stop, and actual sights (albeit tiny ones). Aside from being way too small for my rather large hands, seems like a reasonable pistol if you like tiny .380s. I would certainly pick this over the curve if I had to choose between the two. While Erik and Gabe have pretty much covered what I have to say about the Taurus Curve, and done so more politely than I’m inclined to. I will add that in addition to the long list of “features” I find completely asinine on this gun; if I were to actually shoot it (which I would like to do just to be thorough) I would have to adjust my grip a lot. My off hand thumb ends up extending past the muzzle (my trigger finger almost gets to the muzzle in index position), which would not be healthy for my hand. Wilder Tactical’s new “Evolution series” has some interesting new designs they are applying to magazine pouches, holsters, and tourniquet holders. These pouches use a clamshell style design held together with shock cord (similar to the Taco pouches) but using Kydex instead of nylon. The shock cord weaves through the two halves of the pouch and is secured with a cord lock. The result is a rigid but adjustable pouch that can hold magazines or tourniquets of different sizes. They also make a holster which can hold similarly sized handguns. As a shooting instructor I like to switch up different guns in different classes. The Wilder mag pouches should be able to hold mags for most of the pistols I might use in any given class. Pouches are available with belt clips and can be adapted for Tech-Lock, Molle-Lock, and other popular attachment designs. The build quality is excellent and Josh Wilder was a great guy to talk to. I picked up some of his magazine pouches and the TQ pouch, and will be testing them out on the range. I’m going to piggy back on Erik’s post about the Curve with a slightly different angle. Most of us saw pictures of the Curve and expounded WTF. I think the community in general had the same response. I wanted to give the gun a chance as I don’t think it’s fair to review something you haven’t handled. We found out the Taurus didn’t even have this at the Media Range day, which I think is a sign they didn’t want bad reviews, so other than what you may have seen online there will be no reviews from SHOT on how this thing fires. The Curve is really a silly exercise in engineering and design. The curved handle is so minor its almost not worth mentioning. The gun is so small it felt the same in both right and left hands (this is marketed as a right handed gun….whatever that means). The gun comes in two models, one with the integrated laser flashlight combo (either both on or both off, no variable settings) or one without. The unit with the integrated laser light system has a simple flip switch to turn the unit on or off but it is meant to be manipulated by your right hand trigger finger and as we played with it we found it plausible that flicking of this switch in a forceful or panicked manner could result in the trigger finger sliding to the trigger pretty easily. Would this cause accidental discharges? Probably not but it seemed like a bad design choice. Strictly speaking shooting the gun left handed and using your right hand thumb to operate the switch seemed like a better idea. As pointed out by Erik the magazine release was clumsy and the gun has a magazine safety which is a feature I find pretty useless in an actual fighting gun. The lack of slide stop is concerning and when I asked what they recommended if someone had an extended stoppage I got a blank stare. This gun is really a single use unit. Shoot it until it’s empty and hope the target goes down. It’s a close range emergency gun and in that respect it seems OK but for all the buzz it’s really not worth the attention. I’d still like to shoot it but if you want a well designed 380 there are better options. We’ll start with what I liked. The trigger was surprisingly good for a compact .380, and the gun was sized right for its purpose. In lieu of sights the Curve has indexing marks on the rear of the slide. To properly use the gun, you center the back of the slide on your target and press the trigger. In defensive shooting we call this “meat and metal” and at close range, the technique works pretty well. Other anti-features of the Curve were the LED light (too small to be useful) and laser which were difficult to operate, and a superfluous magazine disconnect safety. The magazines had a cumbersome two-sided clip-in design that would make carrying spare magazines bulky to carry. If the gun has a malfunction, you can forget about being able to clear it because of the lack of operational slide release. I did my best to give the Curve a chance. The lack of sights, poor magazine design, and lack of slide release, coupled with superfluous accessories made me want to hate it, but some of the innovations made me simply not like it. I wouldn’t recommend it for serious use without some revisions. To me, it’s another example of a gun that’s meant to be carried but never actually used.